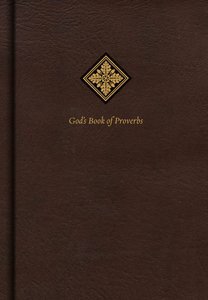 God's Book of Proverbs includes the entire text of the book of Proverbs from the Bible arranged topically. This practical and helpful resource allows readers to quickly access and apply the wisdom and insights found in this sacred portion of Scripture. Also included is the article Connecting Wisdom to Jesus by Trevin Wax explaining how Jesus is the fount from which all wisdom flows. The God's Book of Proverbs features the highly reliable, highly readable text of the Christian Standard Bible (CSB), which stays as literal as possible to the Bible's original meaning without sacrificing clarity. The CSB's optimal blend of accuracy and readability makes Scripture more moving, more memorable, and more motivating to read and share with others. About "God's Book of Proverbs: Biblical Wisdom Arranged By Topic"